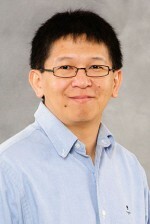 Dr. Huang is an Assistant Professor at the Department of Obstetrics and Gynecology, Medical College of Wisconsin in July, 2012. He received his Ph.D. in the Veterinary Biosciences, College of Veterinary Medicine at Ohio State University in June, 2006. After that, he joined Dr. Tim Huang’s laboratory as a post-doctoral researcher to study on epigenetics, specifically on DNA methylation at Ohio State University. Dr. Huang has 35 peer reviewed publications and 2 book chapters.